In Anti-Social Media: How Facebook Disconnects Us and Undermines Democracy, Siva Vaidhyanathan explores the paradoxically disconnective and antisocial character of social media, with a particular focus on Facebook. Commendably accessible, this book will benefit anyone looking to understand the social-mediatised world in which we are deeply immersed, writes Ignas Kalpokas. Anti-Social Media: How Facebook Disconnects Us and Undermines Democracy. Siva Vaidhyanathan. Oxford UP. 2018. It has by now become a truism that social media is everywhere and that it impacts our lives in a fundamental way. What this omnipresence means and how that effect manifests itself are, however, significantly more complicated matters. 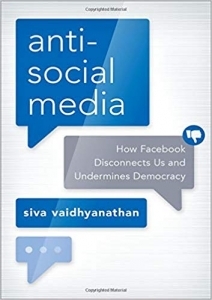 In his new book, Siva Vaidhyanathan presents a largely critical view of such impact by demonstrating the paradoxically, largely disconnective and anti­social character of social media. And while social media-bashing (and of Facebook in particular) seems to be gaining widespread traction, this particular book has a lot to offer. According to the author, the very ubiquity of social media has in itself been an adverse development, particularly in terms of information pollution whereby all content seems equally important and reliable and it all hits you at the same time. This levelling of the information landscape and the ensuing onslaught have led to amplification of content with a strong emotional load, whether that is enthusiastic approval or equally visceral indignation. All one needs to do in order to further a message or just pollute people’s news feeds is to choose a divisive and highly emotionally-charged message. A necessary corollary is also that one is made to feel something as opposed to thinking about something, thereby further reducing the opportunities for reasoned acquisition of knowledge and civil discourse. As a result, Vaidhyanathan alleges, we are driven apart by social media, and not drawn together. The spread of even nonsensical information is further strengthened by the acting out of roles: i.e. one’s desire to highlight being part of a community, or tribe, by presenting oneself as ‘the sort of person who would promote this expression’ (50). The author draws on a broad range of psychological research to demonstrate the point, presenting a convincing case of how this type of tribal consideration easily trumps civic responsibility. Another notable deficiency of the social media information environment to which the book draws our attention is the recurrent formation of filter bubbles, i.e. Facebook’s propensity to feed us content that we are deemed to like. This, of course, makes perfect business sense in terms of increasing user satisfaction and retaining audience attention for longer. However, debate and open-mindedness are correspondingly stifled. Moreover, there is a further downside: the ability to satisfy our needs and desires is data-intensive, and in order to achieve that, Facebook must collect enormous amounts of information to build accurate profiles of its users and their networks. Luckily for Facebook, we, the users, are more than willing to take this on ourselves and engage in self-surveillance and the surveillance of others by posting extensively, sharing information about our and our friends’ activities and doing our everyday things whilst allowing Facebook to observe and track our behaviour. By detailing such practices, Vaidhyanathan reveals the social network as a ‘surveillance machine’. Such surveillance and the ensuing ability to deliver content that is ‘relevant’ to particular users (that conforms to their biases, preconceptions etc) also easily turn Facebook into a manipulation machine: one no longer even needs to collect and download huge amounts of user data to mine for persuasion strategies, Cambridge Analytica-style. This is now done in-house by Facebook itself, precision-targeting messages to groups as tiny as several dozens of people; such capacities are open for purchase by anyone from small businesses to transnational corporations to political parties, individual candidates or pressure groups. Vaidhyanathan is absolutely right to stress the dangerous implications of this ability, not only for business practices but for democracy itself. The precision targeting of news feeds to maximise our satisfaction already hints at another major criticism levelled against social media: that of getting people hooked through the provision of pleasure. Indeed, Facebook gives us pleasure, but it is pleasure of a specific kind – the rewards that we get from Facebook are unpredictable, i.e. sometimes we get what we had expected (validation through likes on a post or a photo), and sometimes we do not. Hence, we keep on trying in the hope that this is going to be the time, that this time the pleasure will be as good as or better than last time. This is also the technique through which casinos operate. Indeed, attention (as manifested through interactions) is the currency of Facebook, as well as other social networks. The argument clearly makes sense: while the richness of today’s media offerings means that attention has become an extremely scarce resource, one fought over by a cornucopia of actors simultaneously, Facebook can amass and offer to advertisers an audience that is as large or as small as necessary, usually highly engaged, and tuning in for ever-new experiences. That, in a nutshell, is its business model that, once again, makes clear economic sense, but it is the broader social and political infrastructure that bears the negative externalities as serious meaningful engagement is cast aside. Inasmuch as engagement is concerned, one further debunking that is worth noting pertains to the myth of Facebook’s special role as a catalyst of pro-democratic revolutions. As Vaidhyanathan puts it, this is a particular case of ‘techno-narcissism’, referring on this occasion to a certain co-optation of the protesters in Iran or of the Arab Spring. This ‘techno-narcissism’ implies that it is ‘our’ technology that has enabled these otherwise hopeless laggards to stand up for themselves, as if for the first time, ignoring both prior and subsequent non-social-media-related activities. Meanwhile, while credit for Western protest movements, such as Occupy, is often given to Facebook as well, Vaidhyanathan implies a rather different relationship: it is not that such protests arose because of and through Facebook, but rather those who were already protesting used Facebook because everyone was on it anyway; if any other mode of communication would have been dominant at that time, it would have been used just as well. Thus, while a facilitating role was certainly played, it was not an exceptional one. But beyond all this criticism, there is an even broader overarching thread of argument to which Vaidhyanathan intends to draw our attention. According to the author, we are approaching a state where not only do large technology firms increasingly have a monopoly over large chunks of our lives, but also competition ensues to become the ‘operative system of our lives’. If this was to materialise, there would be a single dominant company providing the entirety of our lived experience and catering for every need, thereby becoming the reality’s interface. In addition, it would have the entirety of data about individuals and a de facto monopoly of profiting from the data. In such an environment, we would not only no longer want to live outside this system; we would perhaps not even know that such alternative existed or, even if we did, it would seem inferior and far less exciting than the seamless tailor-made interface offered by the ultimate monopolist. If some criticism is to be levied against the book itself, it could come in two major ways. First, a more coherent theoretical and/or methodological backbone would have been desirable. Although a theoretical background of sorts is present in every chapter, this does not come together as whole. And second, despite the critical prowess of the author, some things are perhaps too quickly taken at face value. One prominent example would be taking Mark Zuckerberg’s words with regards to the largely benevolent world-improving intentions of Facebook (clearly, a potentially self-serving assertion) as true without even pausing to question them. The very possibility that at least some of Facebook’s negative effects are not merely side-effects is not even entertained. Overall, however, the book is of great value to both students of media-related disciplines and to the general public. Written in a commendably accessible style and largely free of academic jargon, it is likely to appeal to (and benefit) anyone willing to better understand the world in which we are deeply immersed – a social-mediatised world. Ignas Kalpokas is currently assistant professor at LCC International University and lecturer at Vytautas Magnus University (Lithuania). He received his PhD from the University of Nottingham. Ignas’s research and teaching covers the areas of international relations and international political theory, primarily with respect to sovereignty and globalisation of norms, identity and formation of political communities, the political use of social media, the political impact of digital innovations and information warfare. He is the author of Creativity and Limitation in Political Communities: Spinoza, Schmitt and Ordering (Routledge, 2018). Read more by Ignas Kalpokas. You Like this and I Like that: is Facebook just an echo chamber, or is something more complicated going on? Audit 2017: How far does the growth of social media extend or threaten democratic processes and values? Does it foster or impede greater citizen vigilance and control over government? There is a lot of sense in what the author of the book appears to be saying, but on the ‘techno-narcissism’ bit (social media claiming it was techno that opened up democracy), well I hope he has not ignored that it HAS had an immense effect for those of us involved on the ground floor of politics: aspects of the social media revolution demonstrate that it has clearly aided movements otherwise frozen out in major democracies and I myself was active at times that really prove it. Having stood as a candidate in UK elections for UKIP in the late 90s and 2000s, I was stunned in my early days how the political class and state radio and tv banned us from television and radio. I have written about this before https://www.opendemocracy.net/ourkingdom/damian-hockney/banned-from-campaigning-london-mayor-candidates-in-wrong-class where I referred to the same thing happening to others and myself and the extraordinary nature of the rules whereby the BBC decided who was “in the right class” of candidate, and once it had, then banned others from being allowed to be seen on all but the tiniest of seconds at midnight. Meeting organisers told that they must bar us or the BBC would not bring its cameras and cover them. At the same time, the state banned us from writing to our constituents, using flawed and unfair spending rules to declare to me that “if you write to your constituents you will be disqualified and commit a criminal offence.” There was no social media at the time.How could we campaign? For UKIP, the arrival of social media, where people were finally able to watch Nigel Farage’s speeches in the Europarl (banned from tv in the UK and circulate info and its rapid expansion at the end of that decade was a lifesaver. We were being told with Orwellian weirdness by the BBC that ‘it’s not democratic to give him coverage’, in the early 2000s), It built interest and ensured that we were no longer banned from getting our message across by the state and its media arm. We escaped the prison of the fraudulent ‘balance’ rule. It DID have an impact and it DID deliver results from 2010 onwards. Look back at the millions who watched the Farage speeches in the 2008-onwards period. And the tens of thousands of comments the party had asking “why is this not on tv? Why have we never heard of you?” The party ended up using it pretty much solely in the period of its crucial advance…and as a direct result, the state radio and tv networks (BBC/ITV) were effectively forced by facebook et al to give UKIP coverage, because it was showing in the polls – the party would not have shown in those polls without the assistance of social media and online campaigning. I hope the book makes this kind of thing clear, and has actually gone into proper depth rather than relying upon the current trend to try and discount social media, just because the political elite are bothered by it and hope it will just either go away or they can suppress it “in the interests of democracy”.